Supporters of mayoral candidate Christine Quinn trumpet the historic nature of her candidacy, but her record is nothing to be proud of. A few hours after the Supreme Court released its decision striking down the Defense of Marriage Act, a jubiliant throng gathered outside the Stonewall Inn. There, New York City Council Speaker and mayoral candidate Christine Quinn was in her element: the bar is in her district, and Quinn is the first openly gay person (and the first woman) to hold the speakership, making her one of the most powerful lesbian politicians in the country. When the DOMA case’s plaintiff, 84-year-old New Yorker Edie Windsor, took the podium, she used the occasion to endorse Quinn for mayor. Although Windsor didn’t give her reasons then, the symbolism was clear: a victory by Quinn would be another breakthrough in the long struggle for gay rights. Later that night, Quinn returned to City Hall, where a vote was scheduled on two provisions of the Community Safety Act, one of which would create an enforceable ban on police profiling. The bill has been commonly misunderstood as a ban on racial profiling, but in fact the city already prohibits that. The current law, signed by Mayor Michael Bloomberg in 2004, is so toothless, however, that the NYPD has since conducted almost 3.6 million stop-and-frisks of blacks and Latinos (83 percent of all cases) without running afoul of its terms. The new bill would add bite to the ban by allowing victims to file suit against the NYPD in state court. It also adds sexual orientation, gender and gender identity, among other terms, to the list of protected categories. There’s a lesson here for New Yorkers, LGBT and otherwise: when securing the rights of citizens requires bucking the city’s power elite, Chris Quinn is not on your side. And it’s not just on policing issues where Quinn has been less than a friend to her gay and female constituents. For three years, she held up a bill that would require businesses to offer workers paid sick days, provoking the ire of Gloria Steinem, who pointed out that women are more likely to care for the sick and more likely to hold the kind of precarious, low-wage jobs that would punish them for doing so. Lesbians are among those disproportionately affected, but so are gay men, who are more likely to work in traditionally female-dominated service sector industries. After Steinem and other feminists threatened to withhold their endorsement, and after progressives on the City Council moved to introduce the bill without her support, Quinn brokered a compromise measure. Steinem relented and endorsed Quinn, calling her a skilled politician. That she surely is, but shouldn’t it matter on whose behalf? Similarly, Quinn held up a living-wage bill that would have required developments that receive city subsidies, as well as their business tenants, to pay workers at least $10 an hour plus benefits. Although the bill likewise enjoyed a veto-proof majority, Quinn gutted it anyway, exempting businesses like McDonald’s and Dunkin’ Donuts that are tenants in subsidized shopping malls. Quinn calls the bill she eventually passed “the most impactful living-wage law in the United States,” but by her own office’s estimate, the law affects only 400 to 500 workers a year. That admission, important as it is, doesn’t begin to scratch the surface of what matters to LGBT voters. Gay New Yorkers experience their identity inside the warp and woof of the city—as workers, as subjects of police profiling, as working- and middle-class residents who for the last decade have been squeezed out of a city that is now the most unequal in the country. Only the most narcissistic and tribal conception of identity politics would fail to take that more expansive view of life and politics into account. 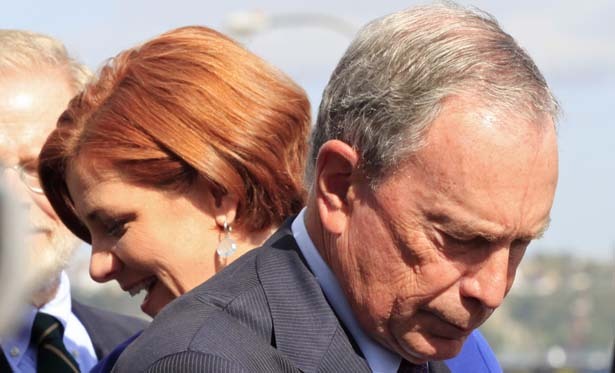 Last month, John Nichols analyzed the Times’s endorsement of Christine Quinn and concluded that it is an endorsement of the Bloomberg status quo.